A school has axed a musical on evolution over its suggestive lyrics and portrayal of Christian views. 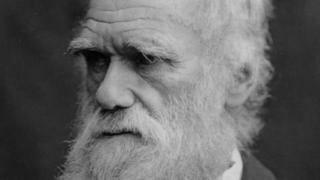 Darwin Rocks, about the scientist Charles Darwin, was due to be performed by about 90 pupils at Hartford Manor Primary School, Cheshire, next month. The move follows six “expressions of concern” from parents, the school said. The musical’s publishers Musicline said it was written by a Christian, adding “we can’t ever recall having courted controversy before”. According to its website, the production is a “light-hearted look” at the work of Darwin, whose theory of evolution, published in 1859, shocked Victorian society by suggesting animals and humans shared a common ancestry. Head teacher Simon Kidwell told the BBC that the school, in Hartford near Northwich, received six “expressions of concern” over lyrics that refer to “bump and grind” – a sexually suggestive dance move. He said three of those parents also believed a bishop was “mocked” in a separate scene. “There were concerns about caricature,” he said, adding the complainants, who include a science teacher from another school, felt its representation of Christian views on science “wasn’t accurate”. One parent said they did not want their daughter to think her ambition to be an engineer contradicted Christian beliefs, Mr Kidwell said. He added the school board was not involved in the decision to drop the production and denied newspaper suggestions a local vicar who is on the board had influenced the move. The school teaches evolution as part of the syllabus and no parents have withdrawn their children from those lessons, Mr Kidwell said. Mike Smith, managing director at Musicline, said the firm “asked Steve Titford – a practising Christian – and the writer of Shakespeare Rocks to write a factual musical about Charles Darwin’s life and beliefs”. He said it had been “received with enthusiasm” and been performed in schools around the world since 2017. “You can’t please all the people all the time, but having been in the school musical business for over 25 years, we can’t ever recall having courted controversy before, ” Mr Smith added. The traditional (and often lazy) depiction of faith v science is old hat. In Britain and the US, there are multiple experts who see no conflict with holding religious beliefs alongside their strong grasp of science. Theistic evolutionists include Francis Collins – the geneticist who led the Human Genome Project and the current director of the National Institutes of Health in the US. David Wilkinson, the astrophysicist and principal of St John’s College, Durham, is also a Methodist lay minister – and often contributes to Thought for the Day. It’s not a surprise there has been some objection to the “mockery” of Christians, who are often depicted as anti-intellectual and anti-science.